The Kobas Loyalty scheme rewards customers with a point per pound that they spend. It is also possible to create loyalty point “boosters” that allocate bonus points on certain items or orders, allowing users to drive trade in quiet periods, or on specific high-margin items. This boost allows you to add fixed bonus points to groups of selected items, which will be accrued whenever the items are added to an order, at a valid time. It is possible to manage multiple items with variable points boosts using the groups function. It is also possible to assign entire EPoS Item categories to boosts, meaning you can have fixed points boosts on “Starters”, “Mains”, or “Desserts”; or even all three! Order multipliers boost points by your chosen factor, regardless of the items in the basket or tab. This boost is best deployed for quiet times to boost trade in t hose hours. For instance, “Triple Points Tuesday”. When setting up your boost, you should input the factor that you wish for the total points, not just the bonus points. Total Points Received: 30 Points. Please note that loyalty points are only awarded for full pounds that have been spent. If, therefore, an order comes to £2.50 and an order multiplier is used. The base points will be 2 and any bonus points will be (2 * n). Post Item Selection Configuration Options contribute to the order total and therefore the loyalty points total, these will be factored into any bonus points awarded. Just as with promotions and discounts, it is possible to define the dates, days, or times that a boost is available. 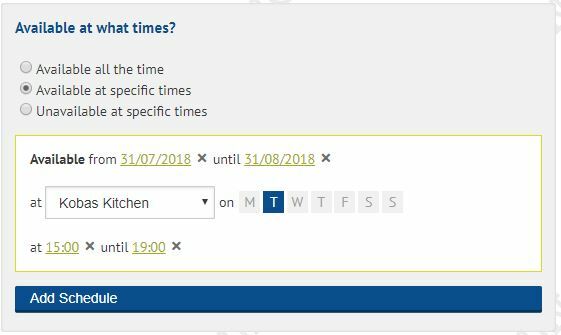 The availability planner is flexible, meaning that users can either select the times that a boost is available, or when the boost is not available. In the example above, our “Triple Points Tuesday” boost is available from 31st July until 31st August, on every Tuesday, between 15:00 until 19:00, in between the lunch and dinner rushes. As shown in the receipt above, the customer is given a breakdown of their base points, bonus points, and total points.